The Aston Martin DB5 made famous by Goldfinger was actually two Aston Martin DB5s, one of which was used for the road scenes and the other used for the scenes with gadgets. The road car today resides safely in a private museum in Cincinnati, but the “effects car” was stolen from a Florida airport hangar in 1997, seemingly without a trace. The car was assumed lost, but, recently, a British firm says they have a hot new lead—the car might, in fact, be in the Middle East. Christopher Marinello, whose firm describes him as “one of the world’s foremost experts in recovering stolen, looted, and missing works of art,” told The Telegraph last month that they aren’t quite sure if the car is the missing DB5, but it’s a possibility worth investigating. Art Recovery International (ARI), which was hired by an unspecified insurance firm to help track down the stolen Aston Martin, have been told it is being held at a specific location in the region. A six figure sum is being offered for information leading to its safe return. Marinello is looking specifically for a photo of the chassis number, which, if it’s real and not tampered with, should read “DP/216/1,” confirmation that it is the Goldfinger DB5. It’s unclear what kind of shape the car is in, though The Telegraph says that the original theft was a bit messy. 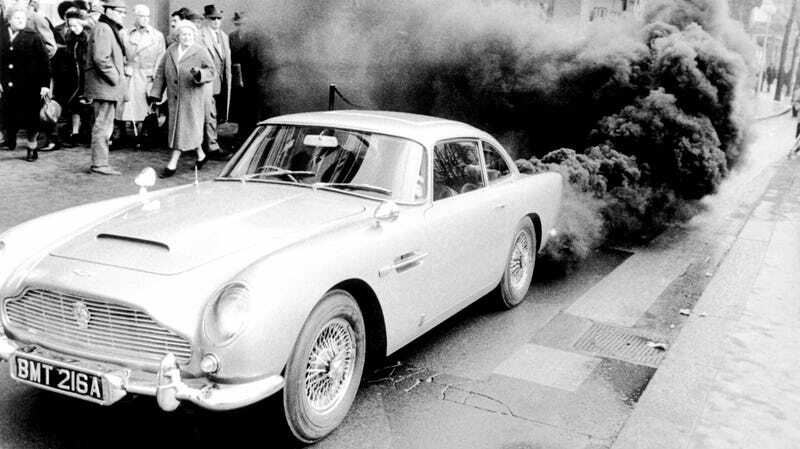 For the filming of Goldfinger the car had been modified to include an array of Bond gadgets, including machine guns, tyre-shredding blades and oil, smoke and water emitters. As a result it was so heavy that when thieves broke into the hangar they had to drag it out by its axles, leaving telltale tyre marks leading up to where it was thought to have been loaded onto a waiting cargo plane. It’s not entirely clear what weight would have to do with dragging a car from a hangar kicking and screaming—why not just put it on some dollies?—but I hope the car is still around somewhere in decent shape. It would be worth up to $13 million, ARI says, or enough for a single martini in London.